Jared Unzipped: A Deep, Glistening Kiss. With a snap of his wrist, the cloaked figure beckoned for the burly royal stone guards to move away. They slowly trotted towards the cellar door and pushed it forth. The creaking scrape of the metal entryway was not pleasant at all. "Now, tell me... what gave you such impressive dominion over that lap dog Karsit?" 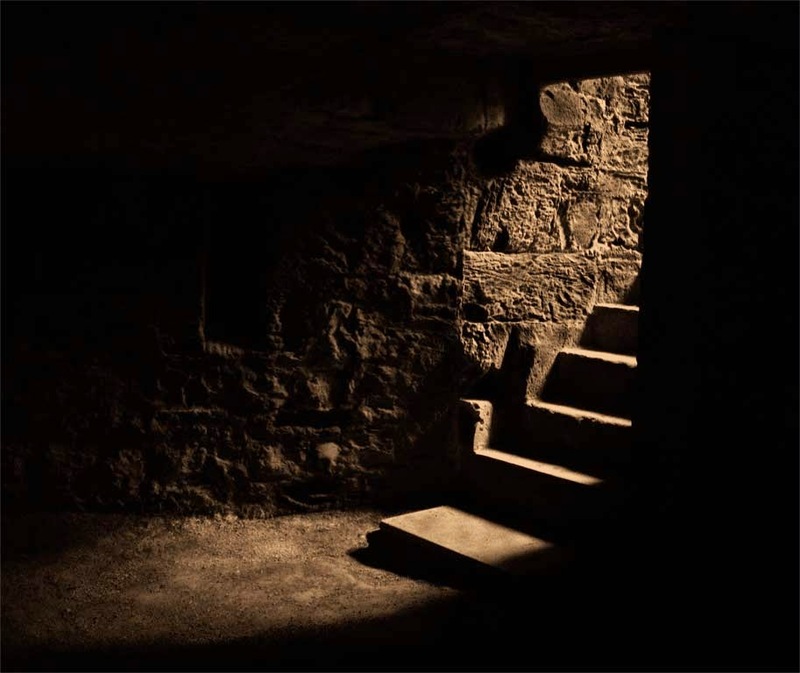 Within the darkness of the cellar, very little light was present. A few random moonbeams flickered through a nearby window. For the benefit of the guards' vision, a single Orb of Lustrobe hovered in the corner. Intermittent breaks in shadow revealed a non-imposing figure chained to the floor. Feminine in appearance, her arms were clearly bound behind her back. She was short with skin that appeared to emit an onyx radiance. Her hair seemed to ripple every which way in long curls; it would change from teal to indigo as the pale light struck each strand. Perhaps most haunting were the prisoner's eyes, which shone a remarkable light blue color. Though the cellar was poorly lit, her eyes were easily visible. "Answers I could readily provide, though you would not understand their meaning." This infuriated the cloaked figure. Rushing forth to grip the prisoner's left arm, he made it readily apparent that his patience was wearing thing. Though, such bravado made little difference to the captive woman. "I typically prefer to know the names of the men who touch me. You're no different." Whipping the hood of his cloak back, the shocking visage of a heinous fiend grinned with delight. "I like a challenge. Let's play." In what could only be described as rupturing crevasses of scarred flesh, this ogre of a man drew himself close to his hostage. Her piercing blue eyes met with his. Any decent woman would have shuddered at his grotesque appearance. Nay, this was no average woman. Parting her lips, the pure essence of her being slipped forth unnoticed. It snaked towards the hobbled mound of talking flesh and drew him tight to her chest. "Your wounds never quite healed properly, did they? Tell me... do you want for the touch of a woman? You must miss the caress of another. Wouldn't you like me to embrace you?" At once a towering predator ready to interrogate his prisoner, the scarred creature now seemed sullen. His mind had grown dim. "Now... tell me your name instead." The crack in the man's face that he once called a mouth parted, letting slip his name. Before the last letter of his name floated out, Arraup had unconsciously removed the shackles binding the vixen. Free from her chains, she ruffled her luscious hair. Sparkling flecks held within her locks came loose and scattered in the air as she did so. Leaning forwards, she placed both hands on the disfigured specter's face and gave him a deep, glistening kiss. It seemed to last forever, at least for Arraup. He was totally, maddeningly, if not somewhat willfully, under her spell. As her slippery lips parted from his, she spoke softly. "My good Arraup, I am Phaalora. Now... take me to your throne room. I have a date with your queen. Oh, and one more thing... run me a bath and fetch some of your water maidens. I'm in need of cleansing. This surely will not take long."